Air passenger numbers have increased rapidly in recent times. In 2014 an estimated 3.2 billion passengers flew on scheduled international air services and there were an estimated, record number, 33 million aircraft departures. Additionally, it is predicted that international passenger flows will continue to increase on average some 5% annually over the next 20 years, according to the IATA industry consensus forecast of 14 February 2011. In tandem with this, as passenger and aircraft movements have increased, security risks have multiplied and the nature and complexity of the threats have intensified. In the past decade and a half, security at border controls has been stepped up intensely. Passports must ensure that the vast majority of travellers, who are bona fide, are able to cross the border in a smooth manner, while also enabling border agents to prevent unauthorised entry. At Smurfit Kappa Security Concepts we have been extremely proactive in developing and providing solutions to meet the needs brought about by these developments. We have had considerable success in printing and supplying ICAO compliant Machine Readable Passports and Machine Readable ePassports, as well as providing personalisation systems. 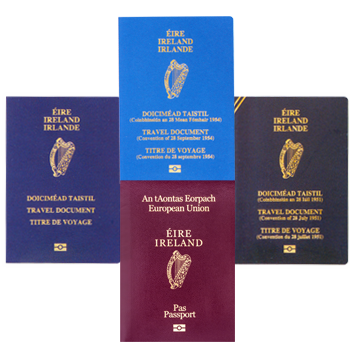 We currently produce and supply the ePassport to the Irish Government and have been producing passports for the Irish Government for over thirty years. In 2015 we managed the introduction of the Irish Passport Card. This project was one of the first of its kind in the identity industry globally. Smurfit Kappa Security Concepts has a thorough understanding of the day to day operational requirements of both passports and ID cards. Our experience and expertise were recognised when both the Irish ePassport and the Passport Card won international awards for their design, quality and innovation. The Irish ePassport won the best Regional ID Document of The Year in 2014 and the Irish Passport Card won again in 2016. 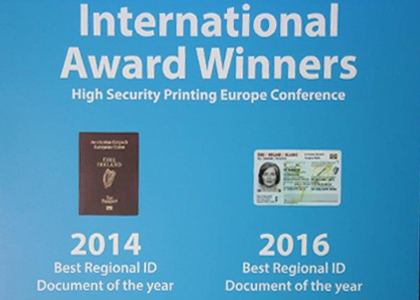 This award aims to promote the best in design, security printing, system infrastructure and implementation of a government passport, identity or other security card scheme by HSP (High Security Printers-Europe). Smurfit Kappa Security Concepts works with a network of specialist trusted partners to design and supply innovative world class travel and identity documents. In addition to paper-based ePassports, we provide a range of cards to the market including the Irish Passport Card and the Irish EU Resident Permit card. Our in-house personalisation equipment uses highly secure laser engraving technology to personalise polycarbonate and PVC cards. The personalisation equipment coupled with our production management system allows great flexibility and enables the issuance of Smart Contact or Contactless Cards as well as standard non-smart cards. At Smurfit Kappa Security Concepts, our philosophy is to develop a total solution that satisfies the needs of the customer, the supplier and the citizen. We are a customer-oriented, market-led company where the satisfaction of customers is central to everything we do. Our goal is to improve the citizen’s experience of the passport acquisition, from application to document issuance, in line with a country’s e-Government strategy. We aim to partner with Governments to create unique passports with aesthetic appeal, which its citizens will be proud to carry, and which the government will be proud to issue.